A Chicago history exhibition crowdsourcing project. 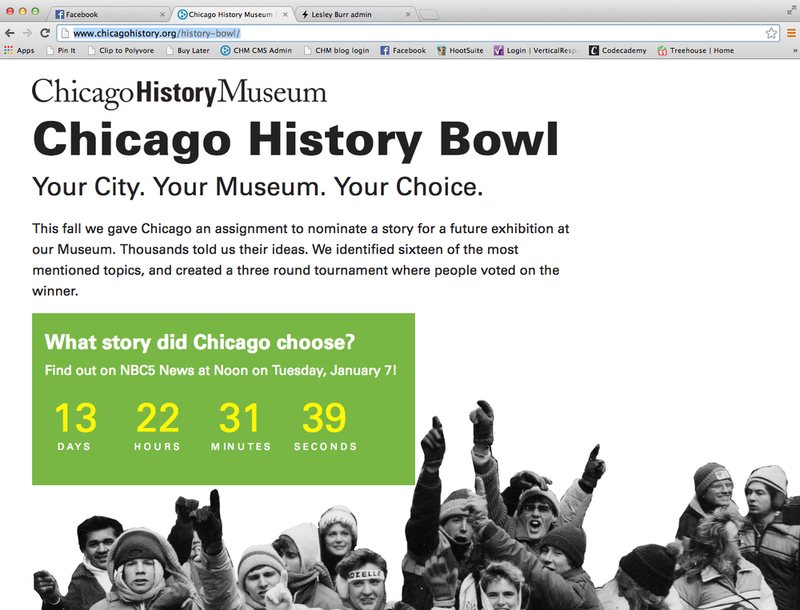 It needed to count down the days until the announcement of the winning exhibition idea on NBC Chicago News at Noon. It needed to announce the winning exhibition topic. Therefore, this product had to be simple and agile enough to be quickly updated and re-designed over the contest's duration, from countdown to completion. Assisted with copywriting, editing, visual design, responsive web design and development, social media optimization, in addition to email marketing and managing the social media campaign. HTML5, CSS3, jQuery, Foundation 5. Microformats, Open Graph, SEO, Photoshop CS6. I created this graphic to be used on social media as part of a campaign to promote our crowdsourcing project, and to encourage people to vote on a future exhibition topic. The voting process was bracket-style, with music and authors as two topics going head-to-head with each other. Rather than focus on specific historical figures, I chose to utilize piano keys and computer keys (the tools of musicians and authors) to convey the clash between two art forms. This "face-off" was inspired by old fashioned boxing posters, but with a modern twist.